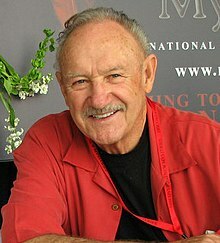 Sante Fe, New Mexico, U.S.
Eugene Allen "Gene" Hackman (born Januar 30, 1930) is a retired American actor an novelist. In a career spannin five decades, Hackman wis nominated for five Academy Awairds, winnin Best Actor in The French Connection an Best Supportin Actor in Unforgiven. He wan three Gowden Globes an twa BAFTAs. ↑ "Eugene Allen Hackman - California, Birth Index". FamilySearch. 30 January 1930. Retrieved 26 October 2014. ↑ "Gene Allen Hackman - United States Census, 1940". FamilySearch. Retrieved 26 October 2014.